This is my R.O.B. I love my R.O.B. I waited literally decades to get this robot and happy that I have him. Heck, getting him was one of the last blog posts I did before I went hiatus. Yesterday one of his brother’s took Reddit by storm. People might have even forgotten about the safe. 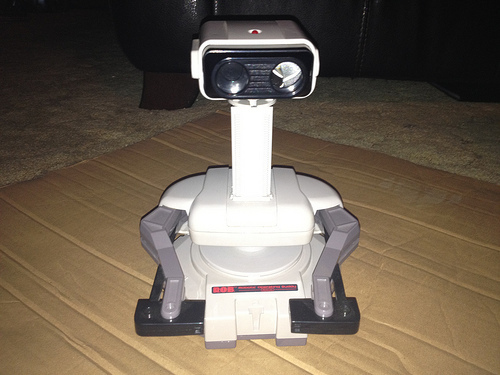 In a thread on Reddit a Best Buy employee showed a picture of someone who brought an original NES (with R.O.B.) to be recycle. First WTF, and second WTF? The employee that took him in stated that he was going to take him in, but his manager said it would cost him his job. I would have totally just walked out of the store with NES in hand and did the golf wave on my way out. That of course is me, and I have a love for all things classic NES. Mashable has a follow article on this case today. The employee didn’t make a mad Prison Breakesque escape with the robot, but corporate headquarters has stepped in and saved R.O.B. from being crushed to death. The cost? He will be enshrined at Best Buy headquarters. You know in a few years they will have forgotten why they saved him in the first placed and recycle him. It is like being encased in carbonite in Jabba’s palace. R.O.B. doesn’t have a rosy future to look forward to. He won’t have people who love him surrounding him in his final Gyromite playing days. As a side note, the employee responsible for R.O.B.’s continuing existence is being checked for any policies he might have broken at Best Buy posting this to Reddit in the first place. He wanted the upvotes by posting R.O.B., but he wasn’t sure he wanted to lose his job. Now he might just end up jobless and R.O.B.less. I will state it again – I would have totally just walked out of the store with NES in hand and did the golf wave on my way out.